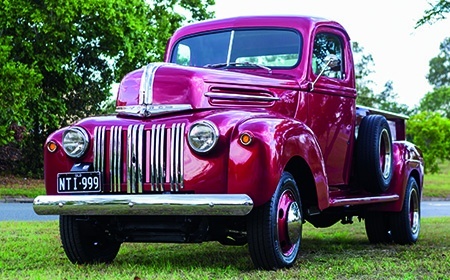 Win a rebuilt 1946 Ford Jailbar, featuring an Isuzu N Series engine and other modern updates! Please join us to help change the future for people living with Motor Neurone Disease. The money raised during this raffle will be going towards MND research via the MND Research Institute of Australia (MNDRIA). The only way we will ever see a world without MND is via funding research for an effective treatment. This fatal disease takes far too many dads, mums, brothers, sisters and friends from our community each year. Two Australians die from MND every day and two more are diagnosed. Australia has super smart, dedicated and passionate researchers working long hours for that illusive breakthrough that will lead to a cure. Progress is definitely being made. Supporting this raffle is your chance to be part of the solution, part of a team working towards ending Motor Neurone Disease forever! NTI has joined forces with the MND and Me Foundation and the MNDRIA to help ensure no one has to face Motor Neurone Disease alone. cylinder turbo diesel engine, Isuzu MYY-6E 6 speed automated manual transmission, complete with custom interior, custom rear tray, custom paintwork and spring rear suspension. The hot rod body is based on a 2017 Isuzu NLR cab chassis with the Ford Jail Bar cabin and ancillaries being grafted onto a purpose built engineered chassis. The vehicle will be registered in Queensland and delivered to the winner. * a security interest certificate under the Motor Vehicles Securities Act 1986. The Raffle commences on the 10th of Mar 2019, closes on the 19th of May 2019 and will be drawn on the 19th of May 2019 at Brisbane Convention Centre at 2pm. Details of the Winner(s) will be displayed at www.mndandme.com.au and The Australian on the 22nd May 2019. State(s) where tickets are on sale ACT, NSW, NT, QLD, SA, TAS, VIC. This raffle is being held for The Mnd And Me Foundation Limited Shop 5 28-32 Cavendish Rd, COORPAROO, QLD, 4151 by Fundraising Agent Luke Muller, National Transport Insurance, 29/400 George Street, Brisbane, QLD 4000 whose authority to fundraise can be verified with the beneficiary . If the prize is unclaimed by the winner, a redraw would occur one month after the initial draw on the 19th of June, 2pm at MND Centre, 5/28 Cavendish Road, Coorparoo. Permit/Licence for ACT R 19/00233, NSW GOCAU/2116, QLD 205125, SA M13635, VIC 10085/19. The odds of winning the stated prizes based on the total possible ticket sales displayed are: 1st Prize 1/45000. Prizes are not transferable or redeemable for cash. Some images are display only and may not be a true reflection of the prize. This raffle is hosted for a service fee by RaffleLink a registered business of Lighthouse Group Pty Ltd ABN: 83161197860, PO Box 6758, Upper Mount Gravatt QLD 4122. Lighthouse Group Pty Ltd as RaffleLink is committed to selling raffle tickets responsibly to support community and charitable organisations.